PSORIASIS IS AN IMMUNE-MEDIATED SKIN DISEASE in which chronic T-cell stimulation by antigen-presenting cells (APC) occurs in the skin. This interplay between the T-cell and APC has been likened to a “T-AP dance” where specific steps must occur in sequence to result in T-cell activation and the disease phenotype; otherwise T-cell anergy would occur. Several novel engineered proteins designed to block specific steps in immune activation (biologic agents) have demonstrated efficacy in the treatment of psoriasis. These agents include fusion proteins, monoclonal antibodies and recombinant cytokines. These medications act at specific steps during the T-AP dance either to inhibit T-cell activation, costimulation and subsequent proliferation of T-cells, lead to immune deviation or induce specific cytokine blockades. The potential increased selectivity for specific pathways in immune activation, clinical efficacy and relative safety of these new agents offers an alternative for the treatment of moderate to severe psoriasis. Fig. 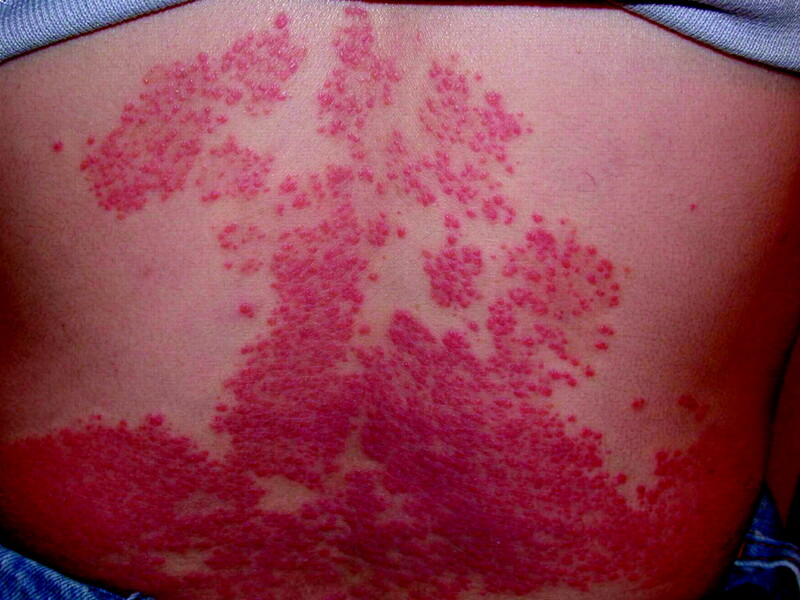 1: Widespread psoriasis. Well-demarcated erythematous hyperkeratotic plaque with slight nonconfluent whitish scale. As psoriasis is a chronic relapsing disease, intermittent treatment may span a lifetime. In order to limit treatment toxicities, the most minimally toxic yet practical approach for the level of body coverage is chosen. 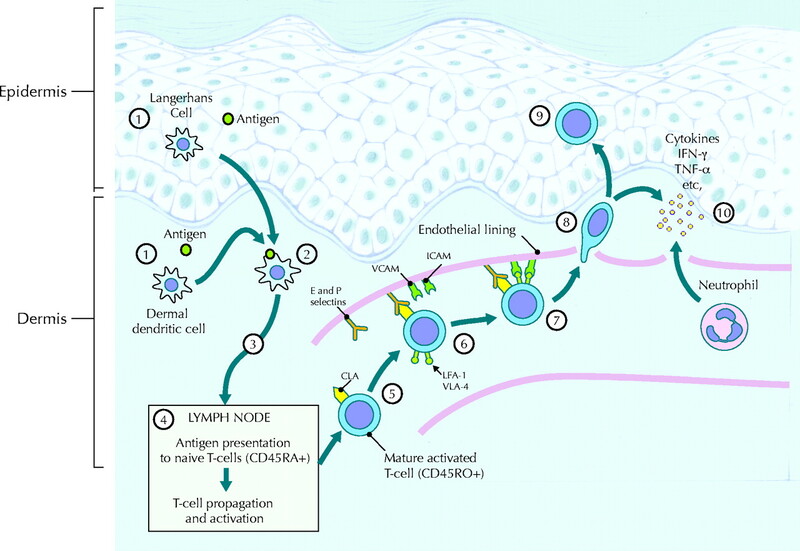 An approach to the treatment of psoriasis is shown in Fig. 2. Although highly successful in the treatment of mild disease, topical agents such as corticosteroids, tar, anthralin, calcipotriol or tazarotene become cumbersome to apply as lesional surface area increases. Furthermore, potential side effects of these therapies increase with the level of application. Nevertheless, topical treatment remains an adjunct in more severe disease to limit the requirement for more aggressive therapies. Phototherapy is a popular option in the treatment of more widespread disease. However, ultraviolet light is generally only available in larger treatment centres, requires a major time commitment (2–3 times per week for many months) and can be associated with an increased risk of cutaneous neoplasms.6 For moderate to severe disease, oral systemic immunosuppressives such as methotrexate and cyclosporine or oral retinoids are generally the mainstays of therapy. However, because of potentially widespread immunosuppression and possible hepatic or renal toxicities, the use of these agents is often limited. Fig. 2: Approach to the treatment of psoriasis. Topical therapy alone is used to treat mild disease (< 2% of the total body surface area). It becomes adjunctive therapy in moderate (2%–10% of the surface area) and severe (> 10% of the surface area) disease to limit the need for treatments that will be potentially more toxic to the patient. Phototherapy is an option for moderate to severe disease. Immunosuppressive agents and oral retinoids can be considered for widespread moderate and severe disease. The biologic agents represent a newer treatment option for people with this severity of disease. Severe disease also includes body areas that may be limited in extent, but result in functional limitations, such as hand and foot involvement. 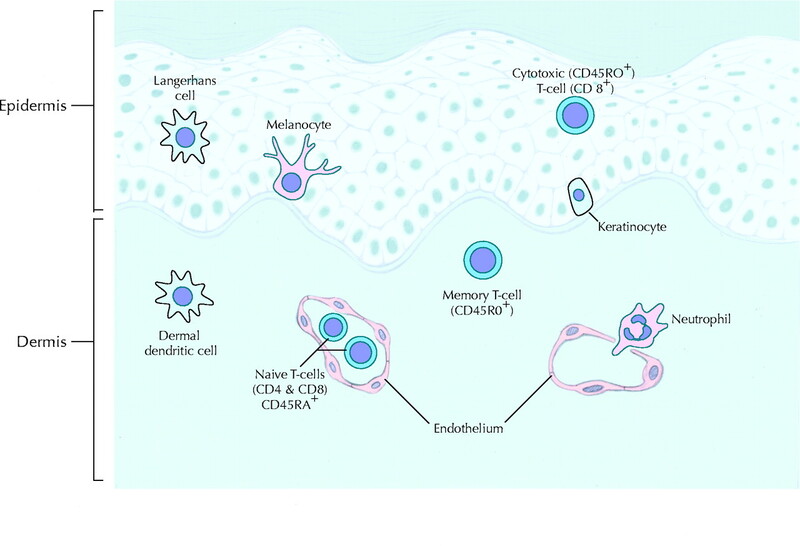 Proinflammatory cytokines such as tumour necrosis factor-alpha (TNF-α) or interleukin-1 (IL-1) are not prominent in normal skin but can be produced by activated immune cells or damaged keratinocytes. They signal the need for both a reparative and immunologic response (Fig. 3). Fig. 4 depicts the initial generation of an immune response to any foreign antigen in the skin. Antigen-presenting cells (APC) mature upon capture of antigen and migrate to the skin-draining lymph node, where they can activate antigen-specific naïve T-cells (see Fig. 5). The mature T-cells proliferate and express the skin-homing marker, cutaneous lymphocyte-associated antigen, which can allow binding to the transmembrane endothelial cell adhesion molecules, E- and P-selectins. When the activated T-cells release cytokines such as TNF-α and interferon-gamma (IFN-γ), regenerative responses can be initiated and other immune effector cells recruited, including neutrophils. Initiation of the T-AP dance occurs when a specific T-cell receptor on a naïve (CD45 RA+) T-cell (CD4 or CD8) encounters its specific processed antigen presented by the APC in the context of major histocompatibility complex proteins (MHC II for exogenous antigens interacting with CD4 T-cells or MHC I for endogenous antigens interacting with CD8 T-cells). Although the nature of the initial stimulating antigen in psoriasis is not known, hypotheses include a molecular mimicry between streptococcal M proteins and human keratins 6 and 17, or the aberrant self-presentation of cutaneous proteins.10,11 Without further APC interaction, this initial interaction would lead to inactivation of the T-cell (i.e., anergy). In order to prevent T-cell anergy, the APC has costimulatory proteins on its surface that interact with specific T-cell proteins that have been up-regulated through T-cell receptor antigen recognition (Figs. 5 and 7). These molecular interactions activate the T-cells to become memory CD4 or CD8 T-cells (CD45 R0+) and induce expression of CD2, IL-2 and IL-2 receptor (IL-2R or CD25). These latter molecules are necessary for subsequent T-cell proliferation and survival (Fig. 5). T-cells activated in skin-draining lymph nodes also acquire cutaneous lymphocyte-associated antigen, which allows them to interact with E- and P-selectins on the endothelial surfaces of the cutaneous vasculature, thus targeting them to sites of cutaneous inflammation. The new biologic agents are recombinant proteins designed to inhibit specific steps in the T-AP dance by blocking T-cell activation and costimulation and subsequent T-cell proliferation or survival, altering the TH1/TC1 to a TH2/TC2 pathway (i.e., immune deviation), or blocking cytokine communication (Table 1 and Fig. 7). Nomenclature for these new agents can be fairly confusing, but generally reflects the delivery approach: antibody, fusion protein or cytokine.13,17 Monoclonal antibodies can be chimeric with fused mouse and human segments (designated “-ximab”), humanized with intermittent murine sequences (designated “-zumab”) or monkey sequences (primatized) in a human backbone, or fully human. Humanized antibodies permit the most flexibility in design, generating minimal blocking of human antimurine antibodies. Fusion proteins are fully human constructs often between the constant (Fc) portion of an immunoglobulin molecule and the binding site of a receptor (designated “-cept”). Finally, recombinant human cytokines can be used as treatment to modify the direction of immune maturation. The sequence of interactions between the T-cell and APC has been the focus for development of the majority of the new biologic agents. Specific agents that interrupt the T-AP dance at this level of T-cell activation and APC costimulation include alefacept, siplizumab, efalizumab, IDEC-114, CTLA4Ig, orthoclone and visilizumab. The third method in blocking the T-AP dance is immune deviation (Table 1, Fig. 7). This approach exploits the competition between TH1 and TH2 cytokines and their mutual down-regulation. Psoriatic TH1 cytokines secreted by APC and activated T-cells (e.g., IFN-γ, IL-12) can be inhibited and down-regulated by exogenous TH2 cytokines (e.g., IL-4, IL-10 and IL-11). This also reduces proinflammatory cytokines such as TNF-α. Clinical trials with both IL-432 and IL-1133 have yielded promising results, although continuous treatments may be necessary in order to achieve sustained improvement in psoriasis. Although early studies with IL-10 (Tenovil) suggested good efficacy,34,35 outcome was not considered sufficiently cost-effective to justify further development of this agent for treatment of people with psoriasis. Although these new biologic agents appear to act with greater target specificity than the systemic immunosuppressives that are currently available, questions remain regarding their safety in patients with ongoing or latent infection, immunosuppression or malignancy. For example, TNF-α appears to be critical for the maintenance of granulomatous-type responses, and the TNF-α inhibitors infliximab and etanercept have been associated with tuberculosis infection or reactivation.41 Since both alefacept and siplizumab result in antibody-mediated cytotoxicity of activated memory T-cells, treatment with these agents can cause a significant drop in T-cell counts.8,20 Furthermore, as many of these agents are new on the market, the relevance of potential associated adverse events such as demyelinating diseases has not yet been established.42 The safety and efficacy of vaccinations is also uncertain with the immunosuppressive nature of these medications. Overall, the projected high cost poses the greatest potential limitation to the wide availability and accessibility of these agents. The biologic agents represent a refined approach to targeted immunosuppression. At present, it is unclear why not all patients respond to each agent. It is likely that different immune pathways may lead to the psoriatic phenotype and thus different costimulatory molecules may have different relevance to disease in a specific person. The diversity of biologic agents becoming available to interrupt the T-AP dance of psoriasis, together with their relative safety, may yield additional effective treatment options for moderate to severe psoriasis. Contributors: Neil Shear and Scott Walsh made substantial contributions to conception and design and to the acquisition, analysis and interpretation of data. Scott Walsh drafted the article and Neil Shear revised it critically for important intellectual content. Both authors approved the final version to be published. Competing interests: Neil Shear has acted as a paid clinical researcher for Serono, Centocor, has received travel assistance to attend advisory board meeting with Biogen Idec and Amgen and is a principal in Ventana Clinical Research Corporation. Krueger JG. The immunologic basis for the treatment of psoriasis with new biologic agents. J Am Acad Dermatol 2002;46:1-23. Koo J. Population-based epidemiologic study of psoriasis with emphasis on quality of life assessment. Dermatol Clin 1996;14(3):485-96. Facts - psoriasis. National Psoriasis Foundation; 2002. Available at www.psoriasis.org/facts/psoriasis/ (accessed 2004 Apr 1). Updike J. From the journal of a leper. Northridge, CA: Lord John Press; 1978. p. 21. Ginsburg IH. Coping with psoriasis: a guide for counselling patients. Cutis 1996;57:323-5. Honigsmann H. Phototherapy for psoriasis. Clin Exp Dermatol 2001;26:343-50. Gottlieb AB, Bos JD. Recombinantly engineered human proteins: transforming the treatment of psoriasis. Clin Immunol 2002;105:105-16. Krueger GG, Papp KA, Stough DB, Loven KH, Gulliver WP, Ellis CN. A randomized, double-blind, placebo-controlled phase III study evaluating efficacy and tolerability of 2 courses of alefacept in patients with chronic plaque psoriasis. J Am Acad Dermatol 2002;47:821-33. Fearon U, Veale DJ. Pathogenesis of psoriatic arthritis. Clin Exp Dermatol 2001;26:333-7. Prinz JC. Psoriasis vulgaris – a sterile antibacterial skin reaction mediated by cross-reactive T-cells? 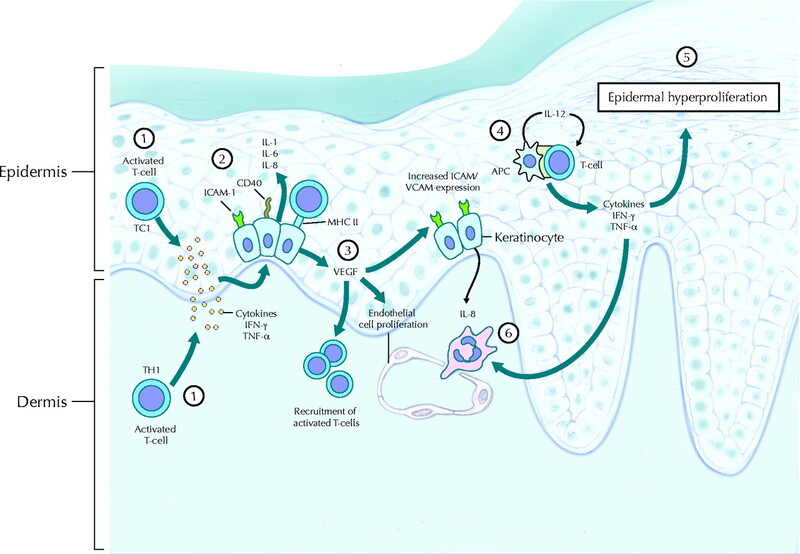 An immunological view of the pathophysiology of psoriasis. Clin Exp Dermatol 2001;26:326-32. Jablonska S, Majewski S. On the immunopathogenesis of psoriasis. Arch Dermatol 2001;137:229-30. Guenther LC, Ortonne JP. Pathophysiology of psoriasis: science behind therapy. J Cutan Med Surg 2002;6:2-7. Mrowietz U. Advances in systemic therapy for psoriasis. Clin Exp Dermatol 2001;26:362-7. Kirby B, Griffiths CEM. Novel immune-based therapies for psoriasis. Br J Dermatol 2002;146:546-51. Gottleib SL, Gilleaudeau P, Johnson R, Estes L, Woodworth TG, Gottlieb AB, et al. Response of psoriasis to a lymphocyte-selective toxin (DAB389IL-2) suggests a primary immune, but not keratinocyte, pathogenic basis. Nat Med 1995;1:442-7. Martin A, Gutierrez E, Muglia J, McDonald CJ, Guzz C, Gottlieb A, et al. A multicenter dose-escalation trial with denileukin diftitox (ONTAK, DAB389IL-2) in patients with severe psoriasis. J Am Acad Dermatol 2001;45: 871-81. Singri P, West DP, Gordon KB. Biologic therapy for psoriasis. Arch Dermatol 2002;183:657-63. Ellis CN, Krueger GG. Treatment of chronic plaque psoriasis by selective targeting of memory effector T lymphocytes. New Engl J Med 2001;345:248-55. Lebwohl M, Christophers E, Langley R, Ortonne JP, Roberts J, Griffiths CEM. An international, randomized, double-blind, placebo-controlled phase 3 trial of intramuscular alefacept in patients with chronic plaque psoriasis. Arch Dermatol 2003;139:719-27. Papp K, Langley R, Matheson R, Dingivan C. Safety, tolerance, and biological activity of MEDI-507 (siplizumab) for the treatment of moderate to severe psoriasis [poster]. American Academy of Dermatology meeting. 2002 February 22-27; New Orleans. Gottlieb AB, Papp KA, Lynde CW, Carey W, Powers J, Rist TE, et al. Subcutaneous efalizumab (anti-CD11a) is effective in the treatment of moderate to severe plaque psoriasis: pooled results of 2 phase III clinical trials [poster]. American Academy of Dermatology meeting; 2002 Feb 22-27; New Orleans. Gordon KB, Leonardi C, Harvey D, Powers J, Phillips H, Weinstein GD, et al. Continuous treatment improves outcomes in patients with moderate to severe plaque psoriasis treated with subcutaneous (sc) efalizumab (anti-CD11a): results from the phase III trial ACD2058g [poster]. American Academy of Dermatology meeting; 2002 Feb 22-27; New Orleans. Gottlieb AB, Lebwohl M, Totoritis MC, Abdulghani AA, Shuey SR, Romano P, et al. Clinical and histologic response to single-dose treatment of moderate to severe psoriasis with an anti-CD80 monoclonal antibody. J Am Acad Dermatol 2002;47:692-700. Abrams JR, Lebwohl MG, Guzzo CA, Jegasothy BV, Goldfarb MT, Goffe BS, et al. CTLA4Ig–mediated blockade of T-cell costimulation in patients with psoriasis vulgaris. J Clin Invest 1999;103:1243-52. Sayegh MH. Finally, CTLA4Ig graduates to the clinic. J Clin Invest 1999;103: 1223-5. Isaacs JD, Burrows N, Wing M, Keogan MT, Rebello PR, Watts RA, et al. 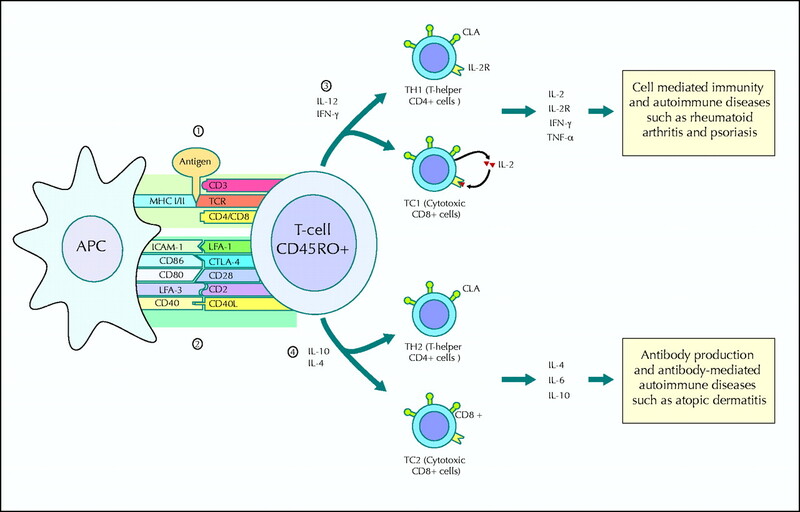 Humanized anti-CD4 monoclonal antibody therapy of autoimmune and inflammatory disease. Clin Exp Immunol 1997;110:158-66. Gottlieb AB, Lebwohl M, Shirin S, Sherr A, Gilleaudeau P, Singer G, et al. Anti-CD4 monoclonal antibody treatment of moderate to severe psoriasis vulgaris: results of a pilot, multicenter, multiple-dose placebo-controlled study. J Am Acad Dermatol 2000;43:595-604. Trajkovic V. Nuvion. Protein Design Labs. Curr Opin Investig Drugs 2002; 3: 411-4. Bachelez H, Glageul B, Dubertret L, Fraitag S, Grossman R, Brousse N, et al. Treatment of recalcitrant plaque psoriasis with a humanized non-depleting antibody to CD4. J Autoimmun 1998;11:53-62. Mrowietz U, Zhu K, Christophers E. Treatment of severe psoriasis with anti-CD25 monoclonal antibodies. Arch Dermatol 2000;136:675-6. Krueger JG, Walters IB, Miyazawa M, Gilleaudeau P, Hakimi J, Light S, et al. Successful in vivo blockade of CD25 (high-affinity interleukin 2 receptor) on T cells by administration of humanized anti-Tac antibody to patients with psoriasis. J Am Acad Dermatol 2000;43:448-58. Ghoreschi K, Thomas P, Breit S, Dugas M, Mailhammer R, van Eden W, et al. Interleukin-4 therapy of psoriasis induces Th2 responses and improves human autoimmune disease. Nat Med 2003;1:40-6. Trepicchio WL, Ozawa M, Walters IB, Kikuchi T, Gilleaudeau P, Bliss JL, et al. Interleukin-11 therapy selectively downregulates type I cytokine proinflammatory pathways in psoriasis lesions. J Clin Invest 1999;104:1527-37. Asadullah K, Friedrich M, Hanneken S, Rohrbach C, Audring H, Vergopoulos A, et al. Effects of systemic interleukin-10 therapy on psoriatic skin lesions: histologic, immunohistologic, and molecular biology findings. J Invest Dermatol 2001;116:721-7. Kimball AB, Kawamura T, Tejura K, Boss C, Hancox AR, Vogel JC, et al. Clinical and immunologic assessment of patients with psoriasis in a randomized, double-blind, placebo-controlled trial using recombinant human interleukin 10. Arch Dermatol 2002;138:1341-6. Chaudhari U, Romano P, Mulcahy LD, Dooley LT, Baker DG, Gottlieb AB. Efficacy and safety of infliximab monotherapy for plaque-type psoriasis: a randomised trial. Lancet 2001;357:1842-7. Mease PJ, Goffe BS, Metz J, Vanderstoep A, Finck B, Burge DJ. Etanercept in the treatment of psoriatic arthritis and psoriasis: a randomised trial. Lancet 2000;356:385-90. Gottlieb AB, Chaudhari U, Mulcahy LD, Li S, Dooley LT, Baker DG. Infliximab monotherapy provides rapid and sustained benefit for plaque-type psoriasis. J Am Acad Dermatol 2003;48:829-35. Lhoner ME, Krueger JG, Gottlieb, AB. Clinical trials of a fully human anti-IL-8 antibody for the treatment of psoriasis [Abstract]. Br J Dermatol 1999;141:989. Krueger JG. Potential new cellular targets of psoriasis. Skin Allergy News 2002;(Suppl);7-9. Gardam MA, Keystone EC, Menzies R, Manners S, Skamene E, Long R, et al. Anti-tumour necrosis factor agents and tuberculosis risk: mechanisms of action and clinical management. Lancet Infect Dis 2003;3:148-55. Mohan N, Edwards ET, Cupps TR, Oliverio PJ, Sandberg G, Crayton H, et al. Demyelination occurring during anti-tumor necrosis factor alpha therapy for inflammatory arthritides. Arthritis Rheum 2001;44:2862-9.